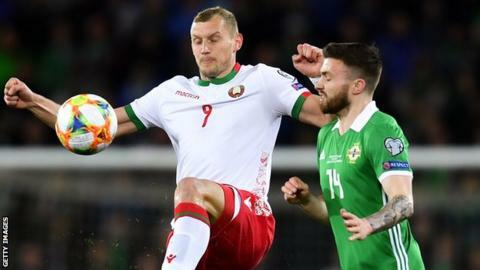 A late goal from substitute Josh Magennis gave a dominant Northern Ireland a vital Euro 2020 qualifier victory over Belarus in Belfast. A low cross from Paddy McNair was finished from close range by the Bolton striker to secure a deserved win. Leicester City defender Jonny Evans headed NI into the lead on the half hour but Igor Stasevich equalised with a deflected shot three minutes later. The victory sees NI top Group C with two wins from their first two games. Germany beat the Netherlands 3-2 on Sunday, leaving both the big European superpowers on three points in the group, the Dutch having beaten Belarus 4-0 three days ago. In a hugely exciting climax to the match, Northern Ireland goalkeeper Bailey Peacock-Farrell made a fantastic save from Pavel Nekhaychik at the back post in the dying seconds to preserve the home side’s 100% start to their Euro qualifying campaign. Having beaten Estonia 2-0 on Thursday, it had looked like Michael O’Neill’s side were going to be held to a draw by a dogged Belarus, but the relief and joy in the Windsor Park crowd, which had been hugely vocal throughout, was palpable at the final whistle. The south Belfast stadium was back to its bouncing best, with the fans realising how important it was for Northern Ireland to claim maximum points from their opening two games, with Germany and the Netherlands awaiting in Group C in the autumn. O’Neill used last year’s Nations League matches to evolve his squad’s style of play after the disappointment of losing out in the play-offs for the 2018 World Cup finals. A more positive, possession-based approach has been developing – if without huge success in front of goal of late – and it was once again evident on Sunday, particularly in the opening half hour. Driven by inspirational captain Steven Davis from a deeper-lying midfield role, Northern Ireland attacked their visitors with energy and vigour from the outset, with McNair and Kyle Lafferty both forcing good saves from Belarusian keeper Andrei Kilmovich. It was a clever and well-executed short corner routine that created Evans’ opener after 30 minutes. Jordan Jones rolled it to Niall McGinn and the Aberdeen winger’s cross was flicked on at the near post by Davis and the unmarked Evans had time and space to pick his spot and head home from close range. The lead only lasted two minutes, however, with the visitors’ equaliser coming against the run of play when Stasevich hit a diagonal shot from the corner of the box. The ball took a wicked deflection off Stuart Dallas and looped over the back-tracking Northern Ireland keeper Peacock-Farrell, who got an outstretched hand to the ball but could not keep it out. 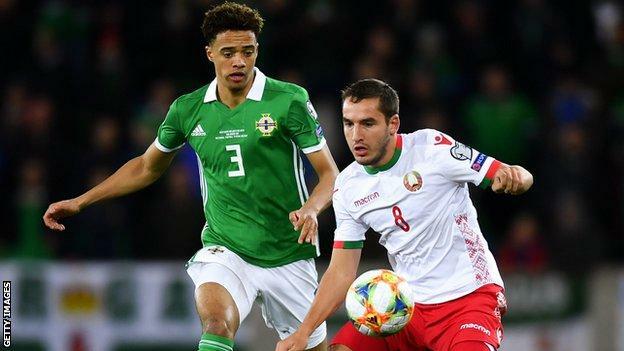 A recurring theme in Northern Ireland’s pointless four-game Nations League campaign was the team’s inability to convert chances and make the most of periods of matches when they dominated possession. 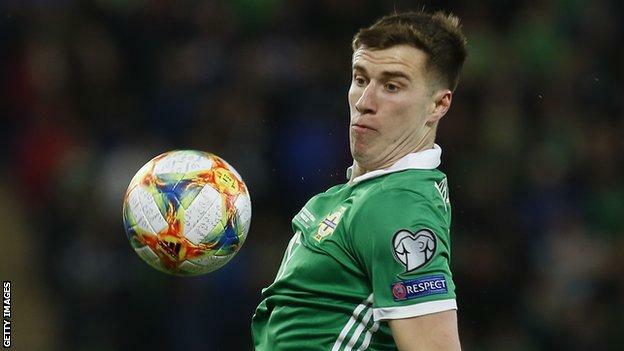 It looked like that was once again set to be the narrative on a cold spring night in Belfast as Northern Ireland created a number of opportunities without finding the winner they were searching for. O’Neill obviously recognised that and brought Magennis off the bench for McGinn and switched from a 4-3-3 to a 4-4-2 formation, with McNair moving to right-back and Dallas pushing forward to a more familiar wide right role. Liam Boyce had come off the bench for Lafferty to partner Magennis up front by the time the late winner arrived. Magennis was involved early in the move for the decisive goal, helping to shift the ball to the right. McNair had surged forward from full-back to deliver an inviting low cross which Magennis side-footed home in front of the Kop. He may not be getting much game time at Middlesbrough, but McNair hid any lack of match fitness well with an imposing performance in midfield. Criticised for missing an easy header against Estonia, the former Manchester United man still had licence to attack on the right of Northern Ireland’s three-pronged midfield – with Davis providing a deep-lying axis and McNair’s Boro teammate George Saville to the left. He has always been a player that O’Neill has seemed to like but, in Oliver Norwood’s absence, he looks to have found a position which could lead to a more regular run in the international starting line-up. Working in tandem with a triangle of full-back Dallas and winger McGinn down the right, he almost opened the scoring in the 20th minute with a firm angled drive which forced a fine save from Klimovich. He had another shot well charged down in the second half and, while he had moved to a deeper full-back role by the time he provided the assist for the winning goal, his place in O’Neill’s engine room could be a long-term one. In the build-up to this opening double header, the Northern Ireland camp had not tried to disguise the importance of securing maximum points. O’Neill’s men could do with a repeat in June when they take on Belarus and Estonia away from home. There are plenty of grounds for optimism for that scenario, with Northern Ireland being more dominant against both sides than the two scorelines this week might suggest. The biggest concern for O’Neill going into the two opening fixtures was how starved of regular club football a lot of his squad have been this season but the likes of McNair and Davis in particular did not seem to be too hindered by a lack of match fitness. 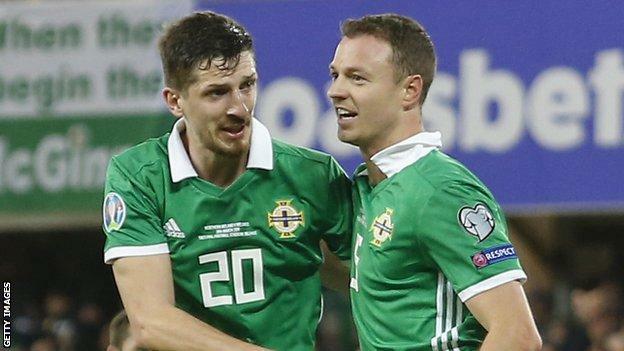 Important players could return from injury for the summer games as Northern Ireland look to accumulate as many points as possible before facing Germany and Holland. Northern Ireland manager Michael O’Neill speaking with Sky Sports: “Delighted obviously with the win and I thought we played very well again. I was disappointed with the way we conceded the goal but we were in control of the game until the opening goal. “It is hard to create some times, we put good balls into the box, but the set-piece worked well for the opener.